Last week I wrote at length about the development and use of ceramic in the watch industry and one of the main highlights was the IWC Ceramic Der Fliegerchronograph Ref 3705. If you recall, the fantastically named Fliegerchronograph (Flieger is German for flying/aviation) was released in 1994 and was the world's first pilot's chronograph in a ceramic case. There were less than 2000 of these pieces produced because of the expense of creating a ceramic case at the time and as such were around 50% more expensive than the stainless steel cases. 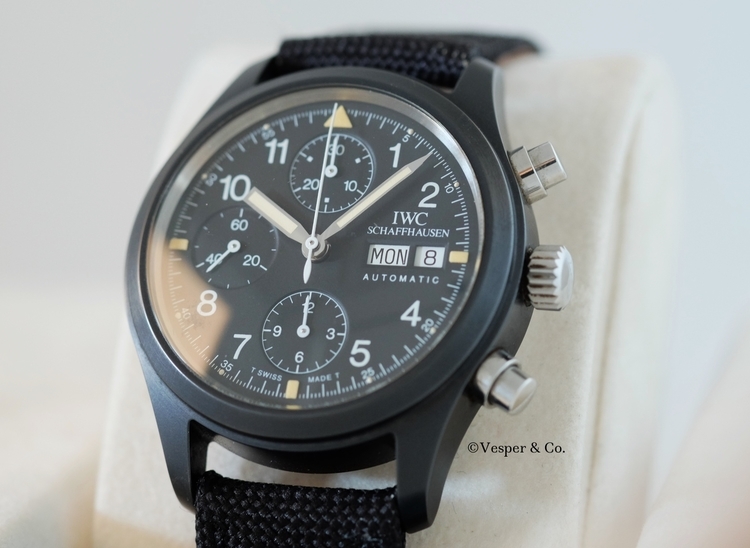 Needless to say these are pretty sought after by collectors of both IWC and pilots watches. Whilst doing research on an upcoming article, I saw that New York based watch sellers Vesper & Co currently have a Ref 3705 on sale (Update: This watch has now been sold) and it sure is a beauty. Thanks to the hardy properties of ceramic, this piece is in mint condition and comes with those two magic words collectors love to read, "box" and "papers". It's currently on a cool looking black canvas strap which really suits the functional pilots style design. Vesper & Co was founded in January of this year and they already have a stunning and varied collection of watches for sale, including a classic Heuer Monaco Ref 1133G, as well as an Urwerk Hexagon Tialn that has to be seen to be believed. A now sold Universal Geneve Tri-Compax was featured over at Hodinkee in February by Benjamin Clymer so you know there are serious people (and their veritable legion of viewers/collectors) looking their way. Head over to Vesperco.com to see more information on this watch and the others currently on offer. All photographs are used with permission from Vesper & Co.